What do potential customers consider valuable features of your new product idea? What latent unmet needs does the idea unearth? Spiral learning discovers unexpected but replicable patterns in what customers value and why. The front end of innovation is a sea of uncertain information about potential customers, their needs, and whether it’s worth it to satisfy those needs. 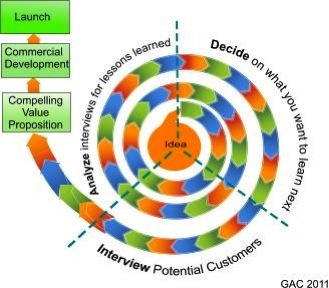 Spiral learning is ideal for building a compelling value proposition to guide commercialization of the product idea. This learning process expands your grasp of the market for the idea. It clarifies for your developers what causes the customers’ view of value. It sometimes leads to discovery of unforeseen opportunities for your product idea. As seen in the graphic, there are three repeating parts in building a compelling value proposition: Decide, Interview, and Analyze. In the Decide part you choose what you want to learn in this part of the spiral path about the customers’ needs. In the next part, Interview, you find potential customers and interview them to understand what they value in your idea and why they value it. In the last part, Analyze, you reflect on lessons learned in the interviews and use this knowledge to shape the Decide part of the next round of the spiral path. A new product idea in the front end of development faces unpredictability about customers’ needs. The store of new knowledge gained at the finish of front-end spiral learning helps remove much of this riskiness. It answers the following question: What is most worthwhile for desirable customers to keep in mind about our new product idea? A valid answer underpins the idea’s compelling value proposition. With this proposition the product’s developers can match expectations of desirable customers at the product’s launch.